Nashville, Tenn. (Mar. 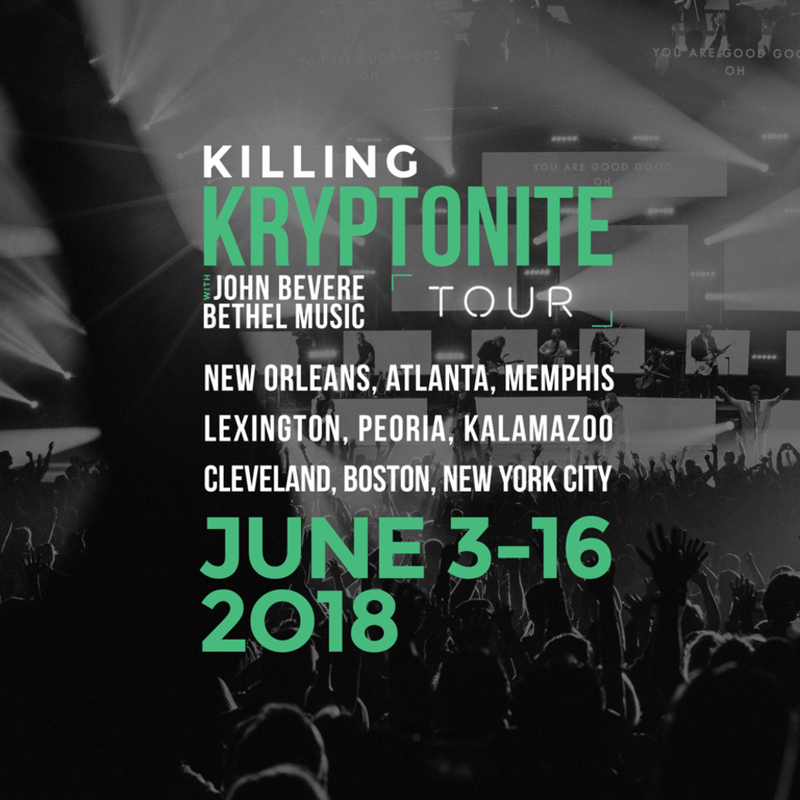 22, 2018) – Pairing a freedom & strength infused message from best-selling author John Bevere and powerful worship ushered by Bethel Music, the “Killing Kryptonite Tour” will begin in June visiting New Orleans, Atlanta, Boston and New York among other markets. The tour carries the namesake of Bevere’s USA Today and Publisher’s Weekly Bestseller about his own story, revealing key biblical truths that moved him from a life of struggle to a life of breakthrough. “I am particularly excited about this tour combining Bethel Music with the message of 'Killing Kryptonite,'" shares Bevere. "I’m so keenly aware of the tremendous gifting on the Bethel Music Team to lead people into the presence of God. In His presence our hearts will be prepared for this life changing prophetic word. Of all the messages God has had me speak to His church over the past thirty years, this one has to be the most impacting. We have seen more people come to know Jesus and begin their journey of discipleship through this message than any other I’ve preached. I see many coming out of these nights with a new level of relationship with God and an authority and power in the Spirit they’ve never known before. I believe many will be saved, healed and set free by the power of the Holy Spirit. I look forward to seeing you there." The vision for the tour is to invite concertgoers to experience truth and powerful transformation through music and teaching. Tickets for the “Killling Kryptonite Tour” are available now, ranging from $20-$55. To purchase or for more information, click here. John Bevere and his wife, Lisa, are the founders of Messenger International—a ministry committed to developing uncompromising followers of Christ who transform our world. A minister and best-selling author, John has authored twenty titles that have been translated into over 100 languages. When he’s home in Colorado, John tries to convince Lisa to take up golf and spends time with his four sons, daughter-in-law, and grandbabies.